Guys, I must confess that I was obsessed with magic shows as a kid. Now with all the exposing of how tricks are done, it's kinda worn off and mostly this obsession returns when it's Hugh Jackman performing the illusions. I'm not really all that familiar with Houdini's life, but the pictures I've seen of him all look REALLY fierce, determined and he's done some really amazing things. So of course I was excited to read a book about a girl who may or may not be his daughter and seriously, the 20s is a fascinating decade no matter what kind of plot you have! I really, really liked Anna. I love how loyal she is to her mother, though she may not exactly like her at times. But she's not afraid to stand up for herself and maybe go against her mother's wishes if it's what it takes to achieve her dream and I can respect that. She's so used to living in the shadow of her mother's beauty that she doesn't really know what to do when two attractive young men start showing interest in her. And though it easily could have been, it's not a love triangle. It's Anna getting to know both guys and trying to figure out if she likes one of them. And I really liked that she wasn't kissing both guys in the process, cause I kinda hate it when that happens. Teri Brown really captured that sense of excitement that I used to get when watching a magic show and it was nice to see it from the other side for a change! And I loved the supernatural element and seeing Anna getting the hang of her powers and coming to terms with them. I really felt her loneliness because she thinks she's the only one and it's hard for her to make friends because of her and her mother's profession. Anna and her mother have a VERY complicated relationship and at times I was just really confused as to whether or not Anna's mother was really trying to sabotage her daughter's success. I mean, it was just a little off and it may just have been their personalities clashing, but I had a hard time understanding it. But in the end we get an explanation, and while it made me want to scream at them to GAH! COMMUNICATE! I know not everyone can always talk about everything. Aside from all the drama surrounding the show and Anna trying to figure out if Harry Houdini really is her father and the seances and Anna's powers, there's also a sweet little romance. There was also a major twist towards the end that I hadn't seen coming until right before it happened, which really had me turning the pages! 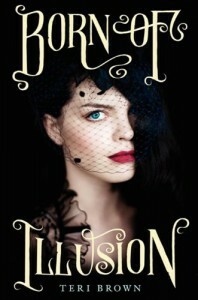 With Born of Illusion, Teri Brown has created a really strong historical read and I just love the time period it's set in! I'm really looking forward to reading Born of Deception, which will feature Rasputin (who I think is really creepy)!